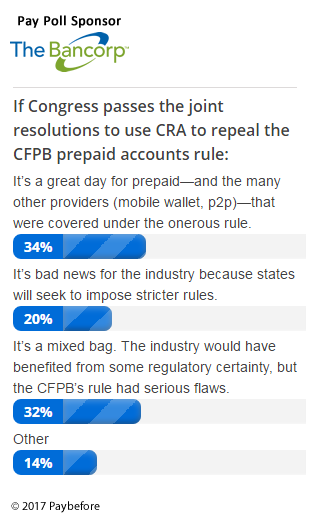 Poll Results: Will the CFPB’s Prepaid Rule Be Repealed? Can Sen. Perdue Undo CFPB Prepaid Accounts Rule? A look at the most popular Viewpoints in Pay Op-Ed so far in 2017 shows two clear trends of thought: What will happen to the CFPB and payments under the Trump administration, and how can prepaid providers reach more consumers and increase profitability? See what’s hot on Paybefore.com this month, including Global Cash Card’s win against onerous payroll card regulations in New York; the CFPB fending off attacks on multiple fronts; a new Blackhawk same-day rebates program; and more. What Will Happen to the CFPB? Republicans have never liked the agency, but so far, their efforts to reform it and reduce its power—or eliminate it altogether—have appeared scattershot. Echoing what a former Secretary of Defense once said: Here’s what we know and what we know we don’t know about the bureau’s future. The top Democrat on the U.S. House Financial Services Committee wants to interview executives from Wells Fargo over a scandal about fake accounts its employees set up for customers. Last year, the CFPB announced a $100 million fine against Wells Fargo for what the agency called “widespread unlawful sales practices.” The agency said the fine was the largest such penalty it has ever issued. The Office of the Comptroller of the Currency is moving forward with its plan to enable fintech companies to become special purpose national banks (SPNBs), releasing a licensing manual draft supplement which provides guidance on how the OCC “will apply the licensing standards and requirements in its existing regulations and policies to fintech companies applying for [SPNB] charters“ and another document that summarizes public comments about the plan to allow SPNBs for fintech companies. The special purpose charter has no shortage of critics, but perhaps the most vocal—New York State—has turned up the dial on its opposition. Prepaid stakeholders scrambling to meet the Oct. 1, 2017, effective date for the CFPB’s final rule on prepaid accounts can take a breath. The CFPB has proposed delaying the effective date by six months—and has signaled it might be open to tweaking some aspects of the rule. The clock is winding down for Congressional lawmakers to repeal the CFPB’s final prepaid accounts rule under the Congressional Review Act (CRA). Under that law, Congress has until May 9—60 legislative days after the law was published in the Federal Register—to repeal the prepaid rule by simple majority vote in the Senate. But with lawmakers currently in the midst of negotiations over a revised health care bill and Democratic opposition to the rollback likely to be strong, proponents of a repeal could run out of time. Score one for London. Even as the U.K. prepares to leave the European Union through Brexit, the British capital and banking and investment center stands as the global hub of fintech, according to Paybefore readers. PayTech Awards entry deadline extended!